While drinking water is beneficial for our health in so many ways, it can get a little boring! 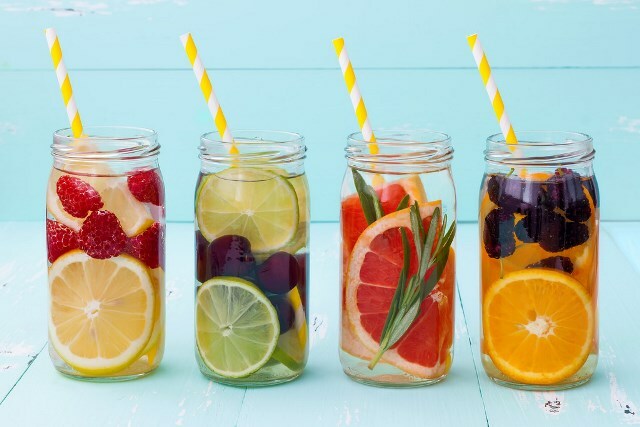 Shake up your daily eight glasses of water by infusing them with fresh fruit and herbs. The fruits permeate the water with their inherent vitamins, giving your refreshed water an extra health kick. Fruit infused water can help with boosting your metabolism, and contains almost no calories. Infused water can cut your caloric intake significantly, as you won’t have to reach for a sugar-laden energy drink to quench your thirst. Fruit and herb infused waters can improve your mood by flushing the toxins from your system – combining fruit such as limes or lemons with green tea and mint can combat headaches, fatigue and can also aid in burning fat. Another benefit of infusing your water is that it will fill you up – because it tastes delicious, you will drink more of it so you are more hydrated. This will decrease the “hungry” feeling that dehydration gives you, making you feel the need to snack less. Infused waters can even help you in the gym. Instead of taking an energy drink or gel with you for after or during your work out, sip on a refreshing, natural bottle of fruity water. Combine lemon, lime and orange slices with a pinch of cinnamon for an energising drink which can help with reducing muscle fatigue and aid in faster muscle recuperation. If you’re trying to detox your body, fruit infused waters are great to include in your detoxification diet. They help your body to keep food moving through your system, and naturally release fat cells for water weight loss. The combinations can be based on your favourite fruits, or can be more thought out in terms of the health benefits – for example, cucumber, lime and lemon water packs a punch for those wanting to lose water weight and control bloating. To make one of these beautifully healthy drinks, simply cut up your desired fruits and herbs, put them into a jug or bottle and pour over enough water to cover them. Refrigerate for about four hours or overnight if you want something extra cold and refreshing. Strawberry, Pineapple and Sage: Sage helps with relaxation and strawberry is great for re-energising the body. Berry Pomegranate Blast: Dark berries and pomegranate seeds contain antioxidants that can help with the ageing process. Citrus, cucumber and Mint: Lemon and cucumber are known for their anti-bloating properties, while mint is refreshing and uplifting. Strawberry and Kiwi Cooler: This fruit combination helps with heart health, digestion and can also regulate blood sugar levels. Apple and Cinnamon: Cinnamon is known for its health benefits and when combined with apple, it can boost your metabolism and even fight infections.